There are so many different things we enjoy about the holidays from the decorating to the gifts and of course the food! Did you know over 5.4 million holiday parties are held every year and delicious feasts are served, our stomachs don't always thank us after - especially for people like me and hubby who are proned to indigestion and heart burn. There's nothing worse than ending the holidays with upset stomach, indigestion or heartburn. 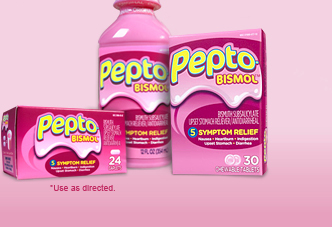 This year if we happened to overdo it and enjoy a little too much festivities in our bellies, Pepto-Bismol has our Pepto moments covered! I have had my share of Pepto-moments. Over induldgence causing serious heart burn. I don't mind the liquid Pepto but hubby can't swallow medicines so its nice to have the chewable tablet option. Remember to always consult your doctor if you are unsure. 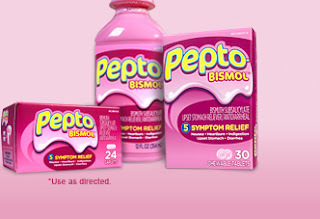 For more information about Pepto-Bismol products please visit www.pepto-bismol.com. You can also follow @Pepto on Twitter and Like Pepto-Bismol on Facebook for updates in your favourite social media news streams! Win it! Eat, drink and be covered with Pepto-Bismol! To help with your post-holiday problems, Pepto-Bismol wants to treat TEN (10) lucky AME readers to a special Pepto-Bismol prize pack ($15 value) which includes PINK Pepto-Bismol oven mitts, a pink spatula and $3 off Pepto product coupon! Please fill out the RaffleCopter ballot below to be entered for your chance to win! Giveaway open to Canadian residents only, information will not be used other than for contacting and prize shipment to the winner as per our policy. Prize provided by P&G. Giveaway ends January 3rd 2013! Disclosure: Posted by AME in participation with the P&GMom ambassador program. Perks are received in association with this program however all comments on this blog are those of the author. Giveaway prize provided by representatives of P&G. Thanks! Yes, after I've had spicy food. Yes, Pepto Bismol has allowed me to indulge in foods. Yes, I have a Pepto moment. Yes, Pepto-Bismol helps me enjoy hot and spicy foods. Yes, but I've never been able to pick out any specific foods, it happens randomly. No, it has never helped me to eat, indulge and enjoy because I don't know what foods will cause heartburn until after. Yes - I find it helps a lot when I eat something that doesn't agree with me! Pepto has helped me to eat, indulge and enjoy -- I love spicy chili but I can't eat it without some help! Yes, I've had Pepto moments. Oh yes! I get severe heartburn and have to have pepto after eating anything spicy! Yes, I've had a Pepto moment. I have used Pepto in the past and have had a "Pepto moment". It helps after I eat greasy foods. actually,no,I have never had peptoo-bismal before,,I dont think! Yes, I've had Pepto moments after eats foods too late at night! Yes I have, just a few days ago! Oh yes, and they are not fun ... always happy to have Pepto around to help take care of them. I have not had a pepto moment, but my hubby sure has! Yes, I have had a Pepto moment. I have had the moment. Yes,I had a pepto moment,especially after these past holidays. Yes! A week ago I ate a little too much and had to use it. I've had a lot of pepto moments! I have them all the time part of Gerds. I've always had to use Pepto Bismol. Yes after eating spicy food. I have, and I like the new cherry flavor Pepto. Hasn't everyone? I'll spare the details, but Pepto does come to the rescue! Yes I have a Pepto moment every time I eat anything with hamburg in it.